Posted on Fri, Jan 6, 2012 : 1:15 p.m.
Mac's Acadian Seafood Shack was one of four downtown Saline business struck by break-ins on Thursday. More than $1,000 was stolen from the restaurant. Four downtown Saline businesses were broken into between Wednesday evening and Thursday morning, with more than $1,000 stolen from one restaurant, Saline police said today. Mac’s Acadian Seafood Shack, the Spotted Dog Winery, The Cobblestone Rose Gift Shop and Maureen’s Designs were all broken into between 8 p.m. Wednesday and 7 a.m. Thursday, police said. 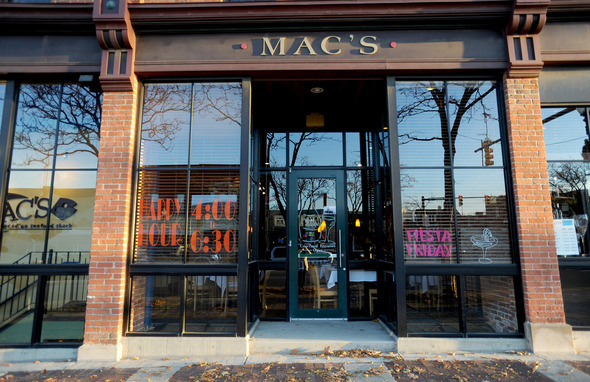 Mac’s was the business that was hit the hardest as police discovered $1,015 in cash was stolen from the restaurant. Police believe all of the break-ins are related and police reports indicated nothing was stolen from the Spotted Dog Winery, The Cobblestone Rose Gift Shop and Maureen’s Designs. The suspect, or suspects, appeared to be only after cash and pulled out cash register drawers at the gift shop and Maureen’s Designs, but only change was in the drawers and all the money was still there in the morning, reports indicated. The police report for the break-in at the Spotted Dog Winery did not appear to be complete on Friday morning. Police were originally dispatched at 8:26 a.m. Thursday to Mac’s Acadian Seafood Shack, 102 E. Michigan Ave., for a report of a burglary. The suspect, or suspects, forcibly gained entry to the store. Nothing besides the $1,015 in cash was taken, according to police. The break-in at the Spotted Dog Winery, 108 E. Michigan Ave., was also reported at 8:26 a.m. Thursday. While police were investigating that incident, the owner of The Cobblestone Rose Gift Shop, 101 S. Ann Arbor St., approached police and told them that her store had been broken into as well. The owner showed police that the rear entrance door to the store had been kicked in. The door leads to a basement, where the store’s office is located, and all of the drawers in the desk had been pulled out, but nothing appeared to be missing, according to the report. In the upstairs gift shop, a cash register drawer had been pulled out but all the change was left in the drawer, according to the report. Numerous doors in the business had been kicked in, but there was nothing missing from the store. No damage estimate was available Friday. Police walked through the rest of the business complex located at 101 S. Ann Arbor St. and found another business, Maureen’s Designs, also had the door kicked in. The break-in was very similar to the gift shop incident, with a cash register drawer removed but nothing apparently stolen, according to the report. Further investigation revealed footprints coming from behind a boulder wall on the lower level near the business complex, according to reports. A rock had apparently been used to break into at least one of the businesses, according to police. Footprints in the snow near the area indicated the suspect, or suspects, had come from behind the boulder wall, an unusual place for pedestrians to be, jumped over the barrier to the buildings and then had entered the complex, the reports stated. The break-ins are still under investigation. Anyone with information on the incidents is encouraged to email Det. Don Lupi of the Saline Police Department. Kyle Feldscher covers cops and courts for AnnArbor.com. He can be reached at kylefeldscher@annarbor.com or you can follow him on Twitter. Sat, Jan 7, 2012 : 6:49 p.m.
if u need money so bad find a job.don't steal it. Fri, Jan 6, 2012 : 11:58 p.m. This article reminded me to go back to Mac's for the delicious salmon...haven't been there in years. Hope it makes up for a bit of your loss! Fri, Jan 6, 2012 : 9:36 p.m. This is really a shame for the businesses who were hit. Mac's is a favorite restaurant of my wife and I. I think the owner of Mac's probably now regrets leaving that much cash in the register(s) overnight. I used to own a retail store and we never left currency in the register overnight - only just some coin change. Also we left the cash drawer open so a thief wouldn't break it trying to get to the inside of the drawer. Most thieves who break into businesses like these are after cash. They get in and get out as quickly as possible. Security systems can help, but will not always prevent a break-in. If the thief knows he has 15 minutes before the police arrive, that's more than enough time to get into the cash register and be gone. The article makes no mention that any of the businesses had a security system, which is interesting. Fri, Jan 6, 2012 : 8:45 p.m.
Did you mean they were broken into between 1AM and 8AM? That seems more logical as Mac's is open well past 8PM. Fri, Jan 6, 2012 : 9:01 p.m. Chances are you're right. Unfortunately, assuming in my line of work often ends up with egg on my face. Can only state what I emphatically know to be true. And then I need to type it in correctly, as you spotted. Thanks for reading! Fri, Jan 6, 2012 : 8:59 p.m.
Just seems odd that a burglar would come back later in the evening to the same general area. Thanks for the clarification. Fri, Jan 6, 2012 : 8:55 p.m. The likely answer is that they were all broken into sometime within that time frame. However, the owner of the gift shop gave the time range that her store was broken into as between 8 p.m. and 7 a.m. Evidence points to all of these being done at the same time (so probably after Mac's closed), but I can't rule out the possibility that the gift shop was broken into before Mac's closed. That's a long way of saying that Mac's was likely broken into between 1 a.m. and 8 a.m. However, when talking about all four of the incidents, the time range must be factually stated to be between 8 p.m. and 7 a.m.
Fri, Jan 6, 2012 : 8:42 p.m.
Kyle, Any idea how they know it happened before 1AM when it wasn't reported until 8:26AM? Fri, Jan 6, 2012 : 8:46 p.m. Sorry Buster, that is a typo and is supposed to read 7 a.m. I'm changing that. Fri, Jan 6, 2012 : 7:05 p.m.
Might be nice to have some cameras at strategic points of the downtown. Wouldn't take much, since it's a small area to cover. Fri, Jan 6, 2012 : 10:27 p.m. I don't think they came in through the front door right off Michigan ave. More than likely broke in the back where nobody is. More than enough dark areas and yards to run through in the back to disappear afterwards. Fri, Jan 6, 2012 : 7 p.m.
Will not make any comment about Ypsi at this time. Saline police are very busy, but they have their poles in the water and will catch the (fish) suspect/suspects. I'm sure Pittsfield and WCSD will be in to help. As from the story above, they work well together.